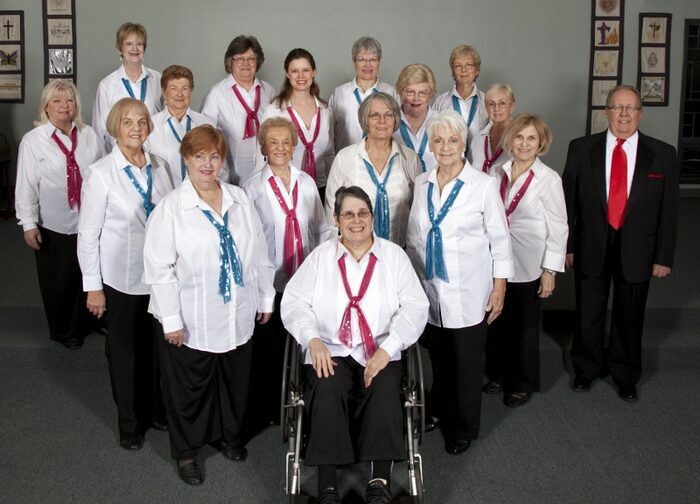 While we are a women's choral group singing many styles of music, barbershop harmony is one we find most rewarding. It is unaccompanied, four-part a capella harmony. The music is usually built on simple melodies and is relatively easy to sing. The a capella style and the ear training necessary for independent part singing make it one of the most challenging and rewarding accomplishments of a vocal ensemble. When the music is sung accurately, with good vocal techniques and proper breath support, the harmony produces overtone vibrations that create a resonant ring unique to this form of music. Although we do sing in SSAA vocal style, the voice parts in barbershop music for women have different names and functions. The lead voice, which generally sings the melody, is below the tenor harmony; the tenor part sings the highest note in the chord; the baritone part fills in the all-important missing note in a chord that may be above or below the melody; and the bass part supplies the harmonic foundation (root or fifth) of the chord. Lead (Soprano II): is the melody and must be sung with authority, clarity and consistent quality throughout her range. The lead sings with limited vibrato to add color and warmth to the sound. The lead is responsible for conveying the interpretation, emotion and inflections of the song. Tenor (Soprano I): is a harmony part sung consistently above the lead. The tenor should have a light, sweet, pure tone the will complement but not overpower or overshadow the lead voice. Lyric sopranos generally make good tenors. Baritone (Alto I): covers approximately the same range as the lead. The baritone harmony notes cross the lead notes; primarily sung below and sometimes above, depending on where the melody is situated. Baritones must constantly adjust their balance to accommodate their position in the chord. They need to have good ear tuning to balance the chord in both pitch and volume. When singing below the lead, she uses a rich full sound that helps solidify the relationship between lead and bass. When above the lead she uses a lighter production, similar to that used by the tenor. Bass (Alto II): is the lowest note in the barbershop chord. Singers should have a rich, mellow voice and generally sing the root and fifth of each chord. The bass sings a relatively straight, well-produced tone with a minimum of vibrato.